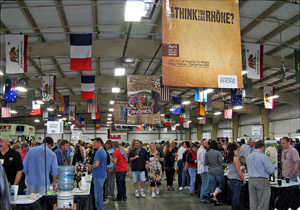 Report on the 19th annual wine tasting presented by Hospice du Rhône (HdR), on Friday April 29th and Saturday April 30th, at the Paso Robles Event Center in Paso Robles, California. The event is the largest celebration and tasting of Rhône-varietal wines in the world. As always, the festivities kicked off with the “Rhône-n-Bowl” bowling tournament on the evening prior to the main event. Event attendees had to rise early the next morning as HdR continued for the next two days with seminars, lunches, an auction, a Friday evening “Soirée,” two big afternoon tastings, and concluding with a farewell barbeque on Saturday evening. In addition, there were peripheral events such as the Thursday “Syrah Shoot-out,” wine dinners at local restaurants, and the traditional late-night partying at the Villa Creek bar in downtown Paso Robles. Hospice du Rhône is a non-profit organization whose purpose is to “improve the business conditions of the grape growers and wine producers of Rhône variety wines and grapes throughout the world.” The group helps to promote Rhône-varietal wines, with a motto of “Twenty-two Varieties, One Vision.” Founded by Mat Garretson as The Viognier Guild, the first gathering of the group was in Georgia (where Mat lived at that time) in 1993. Vintner John Alban, who attended that inaugural event, became Mat’s partner in the organization, and it soon moved to California and changed its name to reflect a broader vision than strictly Viognier. Mat and John worked hard to attract Rhône varietal producers from around the world, and the seminars and tastings are now recognized as among the best at any wine event. Combined with the sense of fun that pervades the weekend, it has become many winelovers’ favorite annual gathering. Mat stepped down from leading HdR a couple of years ago, but John continues to lead it, along with Director Vicki Carroll, Communications Director Faith Wells,and the rest of the dedicated staff and volunteers. Year after year, HdR is a wine experience not to be missed. Hospice du Rhône offers perhaps the best opportunity to taste wines from top US Rhône-style producers along with representative wineries from France and around the world. Over the course of the event, we had wines during seminar presentations, lunches, the Soirée, and other activities, as well as at the two big afternoon tastings. No one who attended could complain of not having enough wines to taste! Wine-themed seminars have long been one of the central features of HdR. Since the Thursday afternoon “Syrah Shoot-out” was for producers only, and I missed Thursday evening’s “Rhône-n-Bowl,” I started out my official HdR activities with the Friday morning seminars. First off was the “Rhône Valley Wines” seminar, with Christophe Tassan, sommelier of MIX in Las Vegas, moderating a panel of three producers from various parts of the Rhône Valley. The second Friday seminar was “Find Your MoJo,” featuring Morgan Twain Peterson and Joey Tensley (“Mo” and “Jo”) with sommelier/journalist Christopher Sawyer moderating. We were up bright and early again Saturday morning for “They Have A Dream,” highlighting four producers who are helping to take the wines of Roussillon to a new level, with moderator Patrick Comiskey of Wine & Spirits Magazine. The final seminar was “High Noon,” with John Alban presenting noted McLaren Vale winemaker Drew Noon. Although overall this year’s seminars were not quite as interesting to me as the ones presented last year, there were still plenty of fascinating stories and fine wines. The two seminars featuring French producers were particularly educational, and included several wines that I thought were among the best of the entire event, from Château de Nages, Domaine Alain Voge, Domaine Roc des Anges, and others. Michel Gassier's discussion of his evolution as a winemaker was particularly well done. And the photos of some of the vineyards in Roussillon – just stunning! I’ve found a new place I want to visit. The dedicated team of HdR sommeliers did a fine job of pouring all the seminar wines – with as many as twelve for a single seminar – and the stemware provided by Riedel Crystal worked nicely with the wines. The seminars and their wines are described in greater detail separately as part of the overall HdR Grape-Nutz report. The food at HdR was one of the many highlights this year. Chef Tracy Fleming of Stewart & Clark Fine Foods in San Luis Obispo served up the hearty Friday and Saturday breakfasts – a nice way to start the day before heading into the morning seminars. The fine Friday Rosé Lunch was from Chef José Dahan of San Luis Obispo’s Et Voilà! while Chef Budi Kazali of the Ballard Inn Restaurant provided the delicious lunch just before the Saturday Live Auction. Many refreshing Rosé wines from Syndicat AOC Tavel were served at the Friday lunch, while Saturday’s lunch was paired with wines from Sud de France. The Friday night Soirée featured tasty pizzas fresh from the mobile pizza oven of Chef Clark Staub’s Full of Life Flatbread in Los Alamos, and fare for the Saturday Farewell BBQ was cooked up by Chef Frank Ostini of The Hitching Post II in Buellton. Overall, I thought the food at HdR this year was very good, probably a step up from last year, and most people I spoke with seemed to agree. It's during the Friday lunch that the annual Hospice du Rhône "Person of the Year" award is presented. This year the award went to importer Patrick Will of VINTUS, who import Guigal wines (among many others) to the US. Patrick has presented the wines of Guigal at the event for many years. His long and important connection with HdR made him a fine choice for this year's award. This was the second year for the Friday evening Soirée portion of HdR. 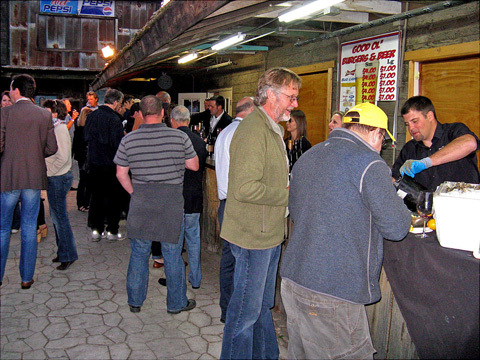 The concept was re-tooled this year, and it was held at the Fairgrounds, with music and food accompanying many fine magnums of wine selected by sommeliers and producers at the event. I found the Soirée this year to be quite enjoyable, and it should take its place with the other regular features of HdR weekend. The Saturday Live Auction featured a variety of auction lots, including wine, dining, tours, and more. The top auction bid this year went to a lot that featured 19 magnums and two double magnums from Denner, Epoch, Saxum, Torrin, and Villa Creek wineries along with a dinner for ten catered by Chef Tom Fundaro of Villa Creek Restaurant. More auction details are described separately as part of the overall HdR Grape-Nutz report. Wrapping up HdR was the Saturday Farewell BBQ at the Fairgrounds. With some delicious barbeque fare and spirited country and rockabilly music from Monte Mills and the Lucky Horseshoe Band, it was a good time for all. The winner of the Syrah Shoot-out was announced at the BBQ – for the second straight year, it was a Westerhold Syrah made by Russell Bevan, allowing him to retain the coveted “Coat du Rhône.” As always, many attendees brought and opened some exceptional bottles of their own wines to go along with the food and company. We had older bottles of Château de Beaucastel, Alban Grenache and Syrah, and Sine Qua Non Syrah at my table – not bad! The BBQ is somewhat bittersweet in that it’s goodbye for another year to many friends whom I only see at HdR – but that only makes me look forward to the next year’s event all the more. Perhaps the continued economic slump is to blame, but I sensed that the turnout this year was lower than at last year’s event, and I heard similar comments from other people. I missed seeing a number of “regulars” who didn’t make it to Paso Robles this year. That included former HdR “Person of the Year” award winner Tom Hill, who had attended the very first Viognier Guild event (which was called “Raisin’ Rhônes” in the ‘90s) and every one since then up to this year, when timing issues prevented him from making it. Hope to see you at HdR next year, Tom! As I found last year, the big afternoon tastings were not as packed as they have sometimes been in past years. The upside to being less crowded was that there were only a few times when there were too many people in front of the more popular tables for me to step right up to get a taste. This was the second year of the Saturday “Self-Pour Speed Tasting” for trade and media, which allowed me to try one or two wines from many producers without having to wait for a pour, a good way to get a broad sampling of wines in a short time. As usual, a number of gourmet food exhibitors were on hand at the Friday and Saturday tastings, though I again found myself more focused on the wines so I didn’t take much advantage of the tasty-looking food that was being offered. And once again, the HdR Event Guide that all attendees receive is the most thorough tasting guidebook of any event I’ve attended. It’s a big help for developing a strategy to approach the afternoon tastings as well as a nice souvenir to take home – I still have the Event Guides for every HdR I’ve attended. In addition to the Event Guide, this was the second year that there was a free download of the “iRhône” app for mobile devices. Among the helpful features was a list of over 1,000 wines poured at the HdR, enabling you to sort by producer, variety, region, or a combination of the three. Unfortunately for me, this year’s version required an update to my iPod Touch OS, which I decided was too much of a pain for me to deal with, so I ended up not installing the latest iRhône. But based on how handy I found last year’s version to be, and I what heard from a couple of people about this year’s, I’m sure it was a big hit again for those who installed and used it. Besides a large number of California wineries pouring at the tastings, there were producers from Arizona, Oregon, and Washington and from six other countries – Argentina, Australia, France, Italy, South Africa, and Spain.From the HdR event guide, I counted over 220 separate producers represented at over 150 winery and importer tables at the tastings, up a bit from last year. As you might expect, California’s Central Coast was very well-represented among the wineries pouring at the tastings. The number of French producers was up again this year, giving us a great opportunity to sample wines that many of us don’t often have a chance to taste. As is always the case with a tasting of this size, it’s impossible to get to all the wineries I would have liked to. I decided to skip some producers I had tried at other recent tastings (including Beckmen, Katin, Skylark, Terre Rouge, Terry Hoage, and Wrath) and winery visits (including Alta Colina, AmByth, Clos Selene, Epoch, L’Aventure, Niner, Stolpman, Thacher, and Torrin). And I wanted to take advantage of the great line-up of French producers pouring at HdR so I spent a good deal of time at their tables. But there were still about a dozen tables I’d hoped to get to but ran out of time. Fortunately, my colleague Al Osterheld was able to visit a number of producers I missed, and some of his notes – designated with an “(AO)” at the end of the note – are included here. The Friday Rhône Rendezvous and Saturday Grand Tasting offered wines encompassing many different styles for Rhône-lovers. From full-throttle wines to lighter ones, they were all on display. Most current releases were from the ‘08 and ‘09 vintages, though there were some from ’07 and earlier too, as well as a few ’10 whites and Rosés. In addition to current releases, a number of wineries graciously opened library wines and others offered previews of wines to be released over the coming year or so. The Friday tasting used to be focused on library wines, but this is no longer the case – both days are now pretty much “anything goes” Rhône-style tastings. Some wineries poured on both days while others were there on only one of the two afternoons. Overall, the quality of wines was very good, and I certainly enjoyed both of the afternoon tastings. One thing that stood out to me was how open and accessible many of the ’09 French reds were, particularly those from the Southern Rhône and other southern French appellations. I tended to prefer the California wines from cooler areas, but there were several warmer-climate bottlings that impressed me too. As usual, a few non-Rhône wines were slipped into the tasting. There were some very promising barrel samples poured this year – in particular, ones from Red Car and Tercero stood out. And this year I’ve expanded the list of “Favorites” to include some of the standout library wines that were poured in addition to current and soon-to-be-released bottled wines from the two main afternoon tastings and the morning seminars. This was my 12th consecutive HdR, and I’m already anticipating next year’s, which will be the 20th annual event. 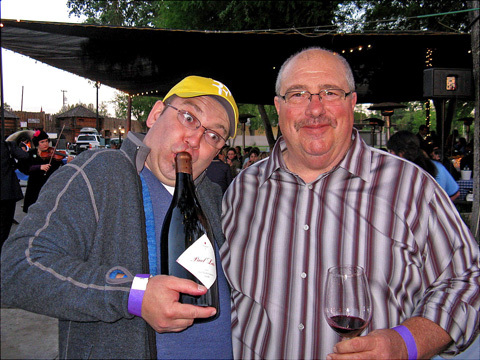 Hospice du Rhône is more than the sum of its parts, and the meals, wines, and good times shared with old and new friends are as memorable as the tastings, if not more so. HdR bills itself as a “celebration of Rhône variety wines,“ and I can’t think of a more appropriate description than celebration. If you’ve never attended, you owe it to yourself to try and make it next year. Alban 2006 Viognier, Alban Estate, Edna Valley. Light color, ripe stone fruit and oak, with some spice and lees notes. Rich and creamy texture with a smooth finish, this is still holding nicely. Alban 2006 “Reva” Syrah, Alban Estate, Edna Valley. Very dark color, high-toned aromatics of blackberry, coffee, spice, and smoky oak, with a fairly dense mouthfeel and still grippy tannins. Andrew Murray 2008 “Espérance,” Central Coast. 60% Grenache, 25% Syrah, 15% Mourvèdre. Medium color, black cherry, spice, and vanilla/oak aromas, medium-bodied with moderate tannins. Arcadian 2006 Syrah, Sleepy Hollow Vineyard, Santa Lucia Highlands. Medium color, showing red fruits, earth, iron, and spice aromas. Very juicy mouthfeel with a long, tasty finish, a distinctive Syrah in a lighter style that should age nicely. Arcadian 2006 Syrah, Stolpman Vineyard, Santa Ynez Valley. Medium-dark color, with aromas of leathery dark fruits and baking spices. Richer on the palate than the Sleepy Hollow bottling, with moderate tannins. Arcadian 2006 Syrah, “Hommage a Max,” Santa Ynez Valley. Medium-dark, displaying savory plum and blueberry aromatics along with spice and pepper notes. Lively mouthfeel with refined tannins, nice. Arcadian 2003 Syrah, Stolpman Vineyard, Santa Ynez Valley. Medium-dark color, with darker fruits, leather, herbs, and earth on the nose. Still fairly rich on the palate, with moderate tannins. Arcadian 2003 Syrah, “Hommage a Max,” Santa Ynez Valley. Made from four favorite barrels, the ’03 includes Syrah from three vineyards. Darker color, this showed greater intensity of fruit along with minerals, earth, and spice. With a silky texture and resolved tannins, this is an elegant Syrah that is aging well. Comments: These wines were poured at the Friday morning seminar – see the separate linked report. Bernat 2008 “Latitude” Syrah, Colson Canyon Vineyard, Santa Barbara County. Dark color, with earthy ripe dark fruits, smoke, and chocolate aromas. Rich, smooth mouthfeel with medium-big tannins on the finish. Bernat 2008 “Focus” Syrah, Estate Vineyard, Santa Ynez Valley. Dark color, with savory blackberry fruit, spice, mocha, and an overlay of vanilla/oak. More structured on the palate than the “Latitude,” with very grippy, youthful tannins. Big Basin 2007 Syrah, Coastview Vineyard, Monterey County. Dark color, intense plum and darker berry fruit, coffee/mocha, smoke, and herbs. Rich yet lively mouthfeel, with fairly chewy tannins and a long finish, nice. A big wine but nicely balanced. Broc 2010 Rosé, Paso Robles. Made from Counoise, about 11.5% alcohol. Very light orange-pink color, with bright and slightly tart red fruit aromas, with a mild floral note. Light, crisp and refreshing. Broc 2009 Roussanne, El Dorado County. Sourced from Ellen Ridge Vineyard and made in an “orange wine” style, this spent 18 days on the skins. Medium-light gold color, displaying pear, apple skin, minerals, and spice on the nose. Medium weight and vibrant on the palate, with some mild tannins showing on the finish, quite distinctive. Broc 2009 “Cassia” Grenache, California. Medium color, with strawberry and cherry fruit plus lots of assorted baking spices. Bright and lively, with moderate tannins. Broc 2007 Syrah, Dry Stack Vineyard, Bennett Valley. Medium-dark color, with dark berry fruit, grilled meat, black pepper, and spice aromas. Medium weight in the mouth, with fairly grippy tannins. Very nice, and should develop well with more cellar time. Cabot 2004 Syrah, “Reed’s,” Humboldt County. Medium color, with red fruits, spice, and a slightly briny note. Vibrant mouthfeel with well-resolved tannins. Cabot 2006 Syrah, Humboldt County. Medium-dark purple, displaying smoky bacon notes along with blackberry and dried herbs. Medium-full bodied and still a bit rough on the palate, with a tannic finish. Cabot 2007 Syrah, Humboldt County. About 1% Viognier, around 20% whole-cluster fermentation. Dark color, with savory dark berry fruit, clove, and a touch of earth. Rounder on the palate than the ’06, but with grippy tannins on the finish, this should develop very nicely over the next few years. Comments: I had tasted some of the Cabot wines in March (the ’06 “Aria’s” Syrah was my favorite of those), so in the interest of time I only tasted a few of their wines here. The ’07 Humboldt Syrah was my favorite of these three, and narrowly missed the “Favorites” list. Caliza 2007 “Azimuth,” Paso Robles. 53% Grenache, 35% Syrah, 12% Mourvèdre. Medium-dark color, with aromas of plum and raspberry, spice, grilled meat, minerals, and vanilla/oak. Fairly rich but not heavy mouthfeel, with grippy, youthful tannins, nice. Callaghan 2009 “Wayne’s” Grenache, Sonoita, Arizona. Medium-light color, very ripe red fruits, smoke, and herbs on the nose. Medium-bodied with some bitterness on the finish. Carica 2008 “The Siren,” Kick Ranch, Sonoma County. 75% Syrah, 12.5% Grenache, 12.5% Mourvèdre. Medium-dark color, showing smoked meat, black cherry and plum, dried herbs, and a dash of pepper. Medium-bodied, vibrant mouthfeel with fairly big tannins on the finish, very tasty now and should age well for at least a few years. Comments: The Carica wines sourced from Kick Ranch are ones to keep an eye on – I’ve liked them quite a bit. Cass 2010 Roussanne, Paso Robles. Very light color, showing citrus, pear, and some spice and lees notes. Lighter-bodied with good acidity and a clean finish. Cass 2008 Syrah, Paso Robles. Medium-dark color, ripe plum and black raspberry framed by spicy oak. Moderate acidity but with a bright finish. Comments: This wine was poured at the Paul M. Young Fine Wines table. Beaucastel 2008 Châteauneuf du Pape. Medium color, intense plum and black cherry fruit, a floral note, lots of spice, and a touch of earth. Medium-bodied and relatively smooth, with a clean finish that was not too tannic. Beaucastel 2007 Châteauneuf du Pape. The color was a bit lighter and redder than the ’08, showing a similar aromatic profile but with added touches of minerals and dried herbs. Livelier on the palate than the ’08, showing better acidity and structure, with more tannin on the finish. Still a youngster, this should be outstanding with more bottle age. Beaucastel 2006 Châteauneuf du Pape. Medium red-purple, the aromatics displayed the earthy, leathery notes Beaucastels often have, along with spices and a darker fruit profile than the other two wines. Smoother mouthfeel and finish than the ’07. Comments: These wines were poured at the Vineyard Brands table. Nice opportunity to taste a three-year vertical from Beaucastel. Cowhorn 2009 Viognier, Applegate Valley, Oregon: Light straw color, restrained aromatics of stone fruit and tropical fruit, with a leesy note. Medium-bodied with good acidity and a pleasant finish. Cowhorn 2009 “Spiral 36,” Applegate Valley, Oregon: Light color, displaying peach, tropical fruit, and floral aromas. Very lively on the palate, with a clean, crisp finish, nice. Cowhorn 2008 “Reserve” Syrah, Applegate Valley, Oregon: From Estrella, 174, and 470 clones. Dark color, with black fruits, coffee, and spice on the nose. Medium-full mouthfeel, with moderate tannins. Comments: First time I’d tasted wines from this biodynamic grower, and they were quite good. db 2008 Syrah Premier Coastal Vineyard, Santa Barbara County. Medium-dark color, earthy and a bit funky, but showing plenty of blackberries, pepper, and spice. Lively and well-structured in the mouth, with a fairly tannic finish. Derby 2008 “Fifteen10” White, Derby Vineyard, Paso Robles. 51% Viognier, 29% Roussanne, 20% Marsanne. Very light straw color, ripe peach and nectarine, lees, and some floral notes on the nose. Somewhat creamy and medium weight on the palate, with moderate acidity and a smooth finish. Derby 2007 Counoise, Derby Vineyard, Paso Robles. 100% Counoise. Medium color, with intensely aromatic floral, raspberry and plum, spice, and vanilla/oak components. Medium-bodied and fairly smooth yet vibrant on the palate and finish, very tasty. Derby 2007 “Fifteen10” Red, Derby Vineyard, Paso Robles. 59% Syrah, 29% Grenache, 12% Mourvèdre. Medium purple color, with ripe plum, smoke, baking spice, and sweet oak aromas. More full-bodied than the Counoise, with medium tannins. Comments: I loved a barrel sample of the Derby Counoise at HdR a couple of years ago – glad to see that it was bottled on its own and that it still retains those beautiful aromatics. Alain Voge 2005 “Les Vieilles Fontaines,” Cornas. From 80-year old vines on granitic soil. Dark color, with intense aromas of meaty, earthy black fruits, iron, and spice. Big and mouthfilling, with very good balance and firm, chewy tannins on the finish. Very nice, and should age well for years to come. Comments: The first two of these wines were poured at the Friday morning seminar – see the separate linked report. Clape 2010 Saint-Péray. 100% Marsanne. Very light color, showing citrus and pear aromas with a touch of minerals. Medium-bodied, with a creamy texture that was still vibrant on the palate. This should benefit from some bottle age. Clape 2008 “Renaissance,” Cornas. From 12-25 year-old vines. Medium color, with very tarry, leathery notes coming to the fore, followed by dark fruits and spice. Medium-bodied with moderate tannins. Clape 2008 Cornas. From 40-80 year-old vines. Medium-dark color, showing both red and black fruits, iodine, meat/game, minerals, and black pepper. Impressive texture and structure on the palate with huge tannins on the finish – this is the real deal of Cornas! Clape 1996 Cornas. Medium ruby/reddish color, with black cherry and plum along with iron and meat elements. Medium-bodied with resolved tannins, perhaps a touch acidic on the finish but a fine mature Cornas. Comments: These wines were poured at the Kermit Lynch Wine Merchant table. It was a real treat to taste the ’96 Cornas in particular. Comments: These wines were poured at the Domaines Pierre Gaillard table. The wines come from Gaillard’s vineyards in the Faugères appellation of Languedoc. Cristia 2009 Châteauneuf du Pape. 90% Grenache, 10% Syrah. Medium-dark purple, with ripe red fruits, spice, and a touch of earth. Medium-bodied, with a silky mouthfeel and a clean and juicy finish. Cristia 2009 “Renaissance,” Châteauneuf du Pape. 60% 100-year old Grenache, 40% Mourvèdre. Darker color, with earthier and darker ripe fruit aromas, together with baking spice and sweet oak. Richer on the palate, but with more structure and tannin on the finish. Cristia 2009 “Vieilles Vignes,” Châteauneuf du Pape. 100% Grenache. Medium-dark color, this was the least fruit-forward of the three Cristia wines, showing lots of earth, spice, and dried herbs along with black cherry and plum fruit. Showing a bit more roundness in the mouth, it finished with grippy young tannins, and should have good potential for cellar age. Biscarelle 2009 “Les Anglaises,” Châteauneuf du Pape. 80% Grenache, 15% Mourvèdre, plus Syrah and Cinsault. Medium-dark color, this displayed earthy plum and blueberry fruits, herbs, and a touch of pepper. Big and mouthfilling, with substantial tannins on the finish. Comments: This wine was poured at the Châteauneuf du Pape Wine Producers table. Mordorée 2010 Rosé, Tavel. Medium-light pink color, with bright aromas of strawberry and spice, with some earthy and savory notes. Lively mouthfeel and a crisp, refreshing finish, very nice. Comments: This wine was poured at the Syndicat AOC Tavel table. As it often is, this was my favorite Rosé of the event. Solitude 2009 “Cuvée Barberini” Blanc, Châteauneuf du Pape. Mostly Roussanne with some Grenache Blanc and Clairette. Medium-light color, with minerally, earthy pear and nectarine aromas. Medium-bodied with a nice texture on the palate and moderately long finish, should be a good candidate for some cellar time. Solitude 2007 “Réserve Secrète,” Châteauneuf du Pape. Medium-dark color, with savory dark berry fruit, some earthy, funky notes, and white pepper on the nose. Very nice texture and structure in the mouth, with medium tannins. Clos des Fées 2008 “La Petite Sibérie,” Côtes du Roussillon Villages. From a single plot of old-vine Grenache. Dark color, with intense ripe plum, blueberry, herb, and oak aromas. Rich and dense on the palate, with a big, tannic finish. Comments: Three of these wines were poured at the Saturday morning seminar – see the separate linked report. Villard 2009 “Les Contours de Deponcins” Viognier, Vin de Pays Collines Rhondaniennes. Very light color, fairly straightforward ripe peach and apricot aromas, medium-bodied with a tasty, smooth finish. Villard 2009 “Deponcins,” Condrieu. Light straw color, with floral, mineral, and stone fruit notes. More lively and structured in the mouth than the previous wine, with a clean finish, nice. Villard 2009 “Les Terrasses du Palat,” Condrieu. Light straw color, with more intense aromatics, showing a strong floral component along with ripe stone fruit and a leesy note. Richer and creamier on the palate but retaining good acidity, with a long, smooth finish, nice. Villard 2009 “Version,” Saint Peray. 100% Marsanne.Light color, subdued fig and melon aromas and a streak of minerality. Fairly light and lean on the palate, with a clean finish. Villard 2008 “Poivre et Sol,” Saint-Joseph. Medium-dark color, displaying lots of black pepper along with red fruits, tar, and spice. Medium-bodied with moderate tannins. Villard 2008 “Mairlant,” Saint-Joseph. Medium-dark color, featuring plum and black cherry, tar, and smoke. Bigger on the palate, with more grippy tannins on the finish. Villard 2008 “Reflet,” Saint-Joseph. Medium-dark color, the fruit profile is a bit more tart, with more earth and herb components plus coffee. Bolder and more structured than the other two Saint-Joseph bottlings. Villard 2008 “Seul en Scène” Syrah, Vin de Pays Collines Rhondaniennes. Medium-dark purple, aromas of plum and black cherry, iron, spice, and minerals. Nice texture in the mouth, with chalky tannins on the finish, nice. Villard 2008 “Le Gallet Blanc,” Côte-Rôtie. Medium-dark color, floral notes along with apricot, darker fruit, spice, and sweet oak. Fairly full-bodied, with a grippy tannic finish. Comments: François Villard presented a fine group of wines, and his Condrieus were particular standouts. Barroche 2008 “Signature,” Châteauneuf du Pape. About 65% Grenache, along with Syrah, Mourvèdre, and Cinsault. Medium color, with bright aromas of ripe red fruits and spices. Very fresh and lively on the palate, with moderate tannins on the finish. Barroche 2007 “Fiancée,” Châteauneuf du Pape. 50% 130-year old Grenache, 50% Syrah. Dark color, with a more earthy, darker fruit profile along with herb and mineral notes. Bigger on the palate with more structure than the ’08 “Signature” bottling. Barroche 2006 “Pure,” Châteauneuf du Pape. Entirely from 100-year old Grenache from a single plot, near Rayas. Medium color, with ripe strawberry and cherry fruit, herbs, and baking spice, along with a floral component. Big and intense, with a rich mouthfeel, good structure, and long finish, very nice. Comments: The Barroche wines are in a bigger, more “modern” style of CdP, but they’re certainly tasty. Comments: This wine was poured at the Saturday morning seminar – see the separate linked report. Comments: These wines were poured at the Saturday morning seminar – see the separate linked report. Cuilleron 2008 “Vertige,” Condrieu. Medium-light color, oak and lees notes are followed by melon, white peach, and spice on the nose. Creamy and rich mouthfeel with moderate acidity and a smooth finish. Cuilleron 2008 “Les Serines,” Saint-Joseph. Dark purple, showing a bit of reduction at first, but opening to both red and black fruits, black pepper, and minerals. Rather youthful and hard on the palate, with lots of acidity and a tannic finish. Cuilleron 2008 “Terres Sombres,” Côte-Rôtie. 100% Syrah. Dark color, showing some floral notes along with blueberry, smoke, and earth. Big and structured, but with relatively refined tannins, nice. Gaillard 2009 Crozes-Hermitage. This is the first Crozes-Hermitage produced by Gaillard. Dark color, featuring black fruits, spice, minerals, and touch of mocha on the nose. Big but balanced, with moderate tannins. Gaillard 2009 Saint-Joseph. Medium-dark color, savory and spicy plum and black raspberry aromas, along with notes of coffee and vanilla. Silky texture on the palate, with medium tannins on the long finish, nice. Gaillard 2009 “Rose Pourpre,” Côte-Rôtie. Medium-dark color, pretty floral notes along with bright, savory dark fruits, along with smoke and a touch of oak. Fairly rich yet vibrant in the mouth, with surprisingly moderate tannins for such a young Côte-Rôtie, nice. Gaillard 2009 Cornas. Very dark color, featuring intense blackberry, iron, spice, and mineral aromas. Big and structured, with a grippy tannic finish. Comments: As was the case last year, Pierre Gaillard’s wines were one of the strongest line-ups at HdR. Dos Cabezas 2009 “El Campo,” Pronghorn Vineyard, Sonoita, Arizona. Blend composed mainly of Mourvèdre and Tempranillo. Medium color, with ripe plum, smoke, pepper, and lots of spice aromas. Medium-full bodied with a nice texture on the palate, finishing with big, chewy tannins, nice. Comments: This was a big step up from previous vintages, and the best wine from Arizona I have tasted yet. Dragonette 2010 Rosé, Santa Ynez Valley. 40% each whole-cluster press Grenache and Mourvèdre and 20% saignée Syrah. Light pink color, with watermelon, a bit of strawberry, and spice on the nose. Lively mouthfeel with a crisp, spicy finish. Dragonette 2008 Syrah, California. 50% from Shadow Canyon Vineyard, 30% from Watch Hill, and 20% from Los Tres Burros. Medium-dark purple, with meaty, smoky dark berry fruit, with an undercurrent of vanilla/oak. Medium-bodied and well-structured for aging, it finished with fairly big tannins. Dragonette 2008 “MJM,” California. 92% Syrah, 6% Grenache, 1% Mourvèdre, and 1% Viognier, from Shadow Canyon, Los Tres Burros, and Paderewski vineyards, 26 months in barrel. Dark color, showing blackberry, earth, coffee, anise and other baking spices, and sweet oak on the nose. More full-bodied than the previous wine but still lively on the palate, with a grippy tannic finish, nice. Dragonette 2009 Grenache, Santa Barbara County. Bottled shortly before the tasting, this is mainly from Thompson and Watch Hill vineyards, and has a little Syrah and Mourvèdre blended in. Medium color, with earthy strawberry, raspberry, and spice aromatics. Bright mouthfeel with moderate tannins. Dragonette 2009 Syrah, Shadow Canyon Vineyard, San Luis Obispo County (barrel sample). Dark color, with black fruits, coffee, smoke, and pepper notes. Very big and structured on the palate, with fairly chewy tannins on the finish. Dragonette 2009 Syrah, Stolpman Vineyard, Santa Ynez Valley (barrel sample). Very dark color, blackberry, mocha, and vanilla/oak aromas, rich and mouthfilling, with a very grippy tannic finish. Comments: These wines were poured at the Vintus table. The first three wines here were an interesting trio that demonstrated the development of tertiary characteristics with age. Écluse 2007 “Rendition,” Paso Robles. 52% Syrah, 42% Grenache, 6% Zinfandel. Medium-dark color, showing ripe boysenberry, and plenty of vanilla and spice on the nose. Fairly full-bodied, with big, grippy tannins on the finish. Écluse 2008 “Improv,” Lock Vineyard, Paso Robles. 60% Syrah, 32% Zinfandel, 8% Merlot. Medium-dark color, with black cherry, sweet oak, and brambly Zinfandel aromas – struck me more like a Zin than a Rhône-style wine. Rich and smooth on the palate, with moderate tannins. Comments: This wine was poured at the Vintus table. Comments: Harrison Clarke Vineyard is located in the Ballard Canyon portion of Santa Ynez Valley, between Beckmen Purisima Mountain and Tierra Alta vineyards, and the soil is mainly a very chalky limestone. Henson 2005 Syrah, Michaud Vineyard, Chalone. Dark color, displaying plum and blueberry, earth, minerals, herb, and iron aromas. Medium-bodied and lively on the palate, with a clean, tasty finish, very nice. Henson 2007 Syrah, Michaud Vineyard, Chalone. Dark color, with black fruits, a bigger herb component, and a vanilla/oak overlay. Bigger mouthfeel with grippier tannins on the finish than the ’05. Henson 2007 Syrah, Luna Matta Vineyard, Paso Robles. Dark color, more fruit-forward and ripe than the Michaud bottlings and showing more of a spice component. Fairly rich in the mouth, with moderate tannins. Comments: This was my first experience with the Henson wines, and the ’05 Syrah was particularly good. Hug 1994 Syrah, Edna Valley. Medium-dark purple with some bricking around the edges, starts with earthy, leathery notes, followed by dark fruits, spice, and a touch of dried herbs. With a smooth mouthfeel and resolved tannins, this is aging gracefully. Hug 2005 “Rena Block” Syrah, Bassetti Vineyard, San Luis Obispo County. Dark color, showing herbal ripe blackberry fruit with some white pepper and sweet oak in support. Fairly rich on the palate with medium-big tannins. This wine is developing nicely and I’d say it’s still several years from its peak. Hug 2009 “el Papé,” Central Coast. 70% Grenache, 25% Mourvèdre, 5% Syrah, sourced from Cedar Lane and Santa Barbara Highlands vineyards. Medium-dark color, with bright, ripe red fruits along with earth and herb notes. Medium-bodied with good acidity, this finished with moderate tannins, should be very pleasant for near- to medium-term drinking. Hug 2009 “el Maestro,” Central Coast. 80% Grenache, 10% Mourvèdre, 10% Syrah, sourced from Cedar Lane and Santa Barbara Highlands vineyards. Medium-dark color, displaying strawberry, bing cherry, spice, and earth aromas, deeper and not quite as ripe as in the “el Papé.” With a bigger mouthfeel and chewy tannins, this wine should be improved by some cellar age. Hug 2009 “el Jefe,” Central Coast. 37% Grenache, 36% Mourvèdre, 27% Syrah. Dark color, with plum and black cherry aromas, earth, plenty of baking spice, and framed by vanilla/oak. More viscous on the palate and with grippy tannins, this was showing very young and needs time to settle down. Hug 2009 Syrah, Cedar Lane Vineyard, Arroyo Seco. Dark color, with savory black fruits, earth, pepper, and spice aromas. Medium-rich mouthfeel, with a fairly big tannic finish, this will also take some patience for the wine to show its best, but it has all the elements for a very fine, cooler-climate style of Syrah. Hug 2008 “el Grandé,” Paso Robles. Syrah sourced from Terry Hoage Vineyard. Very dark color, almost opaque, showing ripe blackberry, smoke, and dried herbs along with an overlay of sweet oak. Quite rich on the palate, the tannins are big but have a relatively smooth feel. The wine’s name fits it well. Comments: The ’94 Syrah, sourced from Alban Vineyard, was the first release from Hug Cellars, and it was a treat to taste it again. The ’09 wines were bottled earlier this year and will need some time to show their best. Jaffurs 2009 Grenache Blanc, Thompson Vineyard, Santa Barbara County. Made in 50% stainless steel and 50% neutral oak. Very light straw color, showing apple/pear aromas along with spice, minerals, and a leesy note. Medium-bodied with good acidity and a pleasant finish. Jaffurs 1998 Syrah, Bien Nacido Vineyard, Santa Maria Valley. Medium light reddish-purple color, showing earth, dark fruit, baking spices, and black pepper. Nice texture, with well-resolved tannins. While no longer vibrant, this has aged gracefully and should still have some years ahead of it. Jaffurs 2001 Syrah, Stolpman Vineyard, Santa Barbara County – Hospice du Rhône bottling. Compared with the ’98 Bien Nacido, this displayed remarkably more youthful ripe fruit as well as a touch of sweet oak on the nose. A denser mouthfeel and still-grippy tannins suggest this still has a ways to go until it’s fully mature. Jaffurs 2009 Syrah, Santa Barbara County. Sourced from three vineyards, and including about 5% Petite Sirah. Dark color, very fruit-forward and a bit primary, while also showing touches of spice and pepper. Juicy mouthfeel and not very tannic, quite tasty and a good choice for near-term drinking. Jaffurs 2009 Syrah, Larner Vineyard, Santa Barbara County. Very dark color, with blackberry, dried herb, spice, and iodine aromas. A powerhouse on the palate, and finishing with grippy, youthful tannins. JC Cellars 2008 Marsanne, Stagecoach Vineyard, Napa Valley. Medium-light yellow color, showing citrus, fig, and a touch of vanilla cream on the nose. Bold and creamy mouthfeel, with some stone fruit notes coming through in the flavors. It’s pleasant now, but this could be an interesting Marsanne to age for awhile. JC Cellars 2005 Syrah, Caldwell Vineyard, Napa Valley. Medium-dark color, with game/meat, black pepper, earth, and dark berry fruit. Medium-full bodied, there were still noticeable tannins. JC Cellars 2006 Syrah, Caldwell Vineyard, Napa Valley. Dark color, this had more intense aromatics than the ’05, with ripe blackberry, baking spice, and coffee dominating. Mouthfilling and rich, but with very good structure and a long tasty finish, quite nice. JC Cellars 2007 Syrah, Caldwell Vineyard, Napa Valley. Dark color, showing more primary fruit than the ’06 or ’05, with touches of herbs, pepper, and a more distinct leathery/earthy component. Not quite as bold on the palate as the ’06, with medium-big tannins. JC Cellars 2009 Zinfandel, Sweetwater Springs Vineyard, Russian River Valley. Recently-bottled, this was fermented and initially aged in concrete, then racked to larger-format cooperage, 20% new. Medium-dark color, showing fresh ripe red fruits and spice, almost Grenache-like. Medium-bodied on the palate and not too tannic. Très Bonnes Années 2009 Syrah, Sonoma County. Sourced from Rockpile and Alexander Valley. Dark color, with blackberry, coffee, minerals, and a dash of black pepper. Big but balanced and lively, with medium-big tannins, this was a tasty Syrah that should show well for near-term drinking but has the structure to age nicely too. Comments: Jeff Cohn showcased a three-year vertical of Caldwell Vineyard Syrahs, and sneaked in an “under the table” Zin too. The Très Bonnes Années Syrah is made for the girl + the fig in Sonoma. Jonata 2008 “La Sangre de Jonata,” Santa Ynez Valley. 98% Syrah, 2% Viognier. Very dark purple, with dark fruit, pepper, spice, iodine, earth, and mineral elements. Rich on the palate with nice texture and firm tannins. A complex young wine that could age into something special, very nice. Jonata 2007 “Todos,” Santa Ynez Valley. About 33% Syrah, 33% Cabernet Sauvignon, with lots of other varieties taking up the rest – Sangiovese, Viognier, Cab Franc, Petit Verdot, and more. Dark color, a bit reductive at first on the nose, but opening to reveal plum, blueberry, earth, coffee, and vanilla. Rich and fairly smooth in the mouth, but with grippy tannins on the finish. Comments: The Jonata wines were impressive for the complexity they showed given their big, rich style. They had a sense of elegance and structure to them that’s often missing in wines of that size. Kenneth Volk 2008 Roussanne, Paso Robles. Very light color, with citrus and lees on the nose. Surprisingly light in body but lively on the palate and the finish. Comments: Ken Volk was founder of Wild Horse winery until selling it in 2003 and establishing Kenneth Volk Vineyards the following year. Equus was a Wild Horse label he started that was devoted to Rhone varietal wines. The wines he brought from his library were all amazingly youthful and fresh. Lagier Meredith 2010 Rosé of Syrah, Mount Veeder, Napa Valley. Recently bottled, this had a light salmon-pink color – maybe a shade lighter than last year’s bottling – and featured this wine’s trademark watermelon and spice aromas, plus a touch of strawberry and a slight floral note. Very crisp and refreshing, should be a fine summertime wine. Lagier Meredith 2002 Syrah, Mount Veeder, Napa Valley. Medium-dark color, showing dark berry fruits, black pepper, iron, and savory components on the nose. Medium-bodied and lively on the palate, the tannins are well-resolved and this is probably nearing its peak, though it should hold well for years more. Lagier Meredith 2006 Syrah, Mount Veeder, Napa Valley. Medium-dark purple, with blackberry, black olive, dried herb, and some meaty notes. A bit bigger and richer in the mouth than the ’02 but retaining good structure, with tannins that still need awhile to smooth out. Comments: This was a nice opportunity to taste an older Lagier Meredith Syrah. I had tasted their more recent Syrahs in March so I did not taste them again here. Linne Calodo 2005 “Martyr,” Paso Robles. 68% Mourvèdre, 29% Syrah, 3% Grenache. Dark color, with earthy ripe plum and blueberry aromas, coffee, and touches of smoke and spice. Lush texture on the palate with tannins that are resolving nicely. Comments: Nicolas Perrin is a relatively new negociant label from Nicolas Jaboulet from the Northern Rhône and the Perrin family from the Southern Rhône. These wines were poured at the Vineyard Brands table. Paul Lato 2008 Syrah “Cinematique,” Larner Vineyard, Santa Ynez Valley. Very dark color, displaying floral notes plus ripe blackberry, spice, mocha, framed by sweet oak. Quite rich mouthfeel with big, grippy tannins that will need time to smooth out. Paul Lato 2008 Syrah “Il Padrino,” Bien Nacido Vineyard, Santa Maria Valley. From 17-year old vines on the Hillside block. Very dark color, with aromas of ripe black fruits, baking spice, iron, smoke, coffee, and oak. Big and structured on the palate, with a chewy tannic finish. Comments: Both wines include about 5%-8% Viognier. Comments: This wine was poured at the Vineyard Brands table. Montédzargues 2010 Rosé, Tavel. Light pink color, with bright strawberry and spice aromas. Crisp and refreshing, nice. Comments: This wine was poured at the Syndicat AOC Tavel table. Qupé 2008 Roussanne, Bien Nacido Hillside Estate, Santa Maria Valley. From the Tablas Creek clone. Light yellow color, aromas of citrus, pear, and white peach, with notes of wax, lees, minerals, and some oak spice. Fairly rich on the palate with a long finish, this should age beautifully, very nice. Comments: Bob Lindquist usually brings a few interesting wines from his library, and that was the case again this year. And after tasting a few California Roussannes that didn’t seem very Roussanne-like, I came to his ‘08 and found the real deal. Red Car 2009 Syrah, Red Car Estate, Sonoma Coast (barrel sample). 10% stems added back, 25% new oak. Dark color, with very pretty floral aromas leading to dark fruit, anise, and pepper notes. Medium-full bodied on the palate with good structure and moderate tannins. Red Car 2009 “Heaven & Earth” Pinot Noir, Bohemian Station, Sonoma Coast. Medium color, with pretty black cherry and spice on the nose, good structure on the palate, and a lingering finish. Comments: The Red Car Syrah barrel sample was a terrific example of cool-climate Sonoma Coast Syrah, and hopefully that character will be retained in the finished wine. Ritual 2008 Mourvèdre, Amador County. 85% Mourvèdre, 15% Syrah. Medium purple color, plum and darker fruits, smoke, and earth aromatics, medium weight in the mouth with moderate tannins and some smoke on the finish. Comments: A well-made line-up of wines in a somewhat international style. Tercero 2010 Viognier, White Hawk Vineyard, Santa Barbara County (barrel sample). Aged in 3-4 year old barrels, will be bottled in a few months. Light color, with stone fruit, lees, and a nutty note on the nose. Creamy texture with good acidity and a lively finish. Tercero 2010 “The Outlier,” Santa Ynez Valley. 100% Gewürztraminer, bottled a couple of weeks earlier. Very light color, aromatics of ripe lychee and spice. Very vibrant mouthfeel, with a clean, refreshing finish. Tercero 2010 Rosé, Santa Barbara County. From Mourvèdre. Very light pink color, showing watermelon and earth aromas, with a touch of spice. Medium acidity with nice texture and just a touch of tannic bite on the finish. Tercero 2008 Grenache, Larner Vineyard, Santa Ynez Valley. From 362 clone, this is Tercero’s first Grenache from Larner Vineyard. Medium purple color, featuring intense plum and black cherry, plus an assortment of baking spices. Medium-bodied with substantial tannins, some cellar time should smooth this out nicely. Tercero 2009 Grenache, Larner Vineyard, Santa Ynez Valley (barrel sample). From 362 clone, 100% whole-cluster fermentation – this will a separate “whole-cluster” bottling. A bit lighter in color than the bottled ’08 wine, with red fruits, spice, a slight floral note, and a surprising lack of stemmy aromas. Big and structured, with a chewy tannic finish – should make quite an interesting bottling on its own. Tercero 2008 “Cuvée Christie,” Santa Barbara County. 75% Syrah, 12.5% Grenache, 12.5% Mourvèdre, from Watch Hill, Camp 4, and Thompson vineyards. Medium color, with ripe plum, grilled meat, and spice on the nose. Rich mouthfeel with moderately big tannins. Tercero 2008 “Cuvée Loco,” Larner Vineyard, Santa Ynez Valley. 50% Grenache, 50% Syrah. Medium-dark color, showing savory, earthy dark fruits, with a touch of black pepper. Medium-full bodied with grippy tannins, nice. Tercero 2009 Syrah, Thompson Vineyard, Santa Ynez Valley (barrel sample). 100% whole-cluster fermentation – all the ’09 Thompson Syrah was whole-cluster fermented. Dark color, displaying blackberry, earth, some moderately stemmy notes, and loads of spice. Big, somewhat tight, and very tannic right now, this will need plenty of time to develop once it’s bottled. Comments: A strong showing for Larry Schaffer’s Tercero wines, including a couple of very intriguing barrel samples. Torbreck 2007 “The Steading,” Barossa Valley. 60% Grenache, 20% Shiraz, 20% Mataro. Medium garnet-purple color, showing high-toned and ripe red fruits, spice, dried herbs, and vanilla/oak. Fairly lively mouthfeel, with moderately tannic finish. Torbreck 2007 “The Factor” Shiraz, Barossa Valley. Darker color, with ripe blackberry, mocha, and spice. Rich and smooth on the palate, with medium tannins on the finish. VIE 2008 “L’Intruse” Mourvèdre, Santa Barbara County. Medium-dark color, with earthy plum and black cherry fruit, spice, minerals, and some leesy notes. Fairly big and structured in the mouth, with moderate tannins. VIE 2008 Syrah, Las Madres Vineyard, Carneros, Sonoma County. Dark color, showing dark berry fruits, black pepper, touches of herbs and olives, and a dash of oak. Medium-full bodied, with a grippy tannic finish. VIE 2008 Syrah, Thompson Vineyard, Santa Barbara County. Medium-dark color, with earthy plum and darker fruits and spice. Big, structured, and rather tight right now, it finished with firm tannins. VIE 2008 Syrah, White Hawk Vineyard, Santa Barbara County. All from Clone 1. Dark color, more fruit-forward than the Thompson bottling, with blackberry, anise, and pepper on the nose. Rich but vibrant mouthfeel, with a big, tannic finish. VIE 2008 “Les Amours”, Santa Barbara County. Mostly Syrah from Thompson and White Hawk vineyards with some Grenache and Mourvèdre from Alta Mesa Vineyard. Dark color, aromas of plum, blueberry, earth, spice, and minerals. Nicely structured and fairly full-bodied, the tannins were sizable but not harsh, nice. Comments: Bryan Kane’s ‘08 wines were bottled shortly before the event, so they should open up more given a few months in bottle. (Disclosure – I do some occasional work for VIE). Villa Creek 2008 Garnacha, Denner Vineyard, Paso Robles. 100% Grenache. Medium color, with ripe red fruits and lots of spice on the nose. Medium-bodied and lively on the palate, with a moderately tannic finish. Villa Creek 2008 “The High Road,” James Berry Vineyard, Paso Robles. 50% Syrah, 30% Grenache, 20% Mourvèdre. Very dark color, showing ripe plum, blueberry, earth, minerals, and some sweet oak on the nose. Very nice texture on the palate, and finishing with big, chewy tannins, nice. Westerhold 2008 Syrah, Bennett Valley. Dark color, with aromas of ripe blackberry, spice, black pepper, and a touch of vanilla/oak. Full-bodied and rich mouthfeel, with fairly big but refined tannins on the finish, nice. Comments: Made by Russell Bevan, this is the second straight vintage of Westerhold Syrah to win the Thursday afternoon Syrah Shoot-out.